We begin our Totesport review by saying that age is a good indicator when it comes to the reliability of a bookie. So the Tote or Totesport is a quality example of this, as it is only a decade short of celebrating it’s 100th birthday. Totesport first opened it’s doors under this brand name back in 1972, but it was Winston Churchill that established The Tote way back in 1928. The Tote started off as a typical high street betting shop and they now have over 7000 shops that accept The Tote scattered across the UK with more than 4000 employees in total. Back in 2011, Betfred bought Tote and restructured and redesigned its sports book and website into what we know of and see today, since then business has been going extremely well for them and they still have their roots firmly stuck in horse racing and is even the leading UK sponsor for the sport. We are really in for a treat at Totesport and to start with, their website is extremely impressive. Black on green is a great colour combination and Totesport has executed it perfectly. Their site has quite a normal layout and there isn’t too much clutter or commercials getting in the way which frees up a lot of space allowing you to manoeuvre around the site easily. In the very top left hand corner of the homepage you will notice their brand logo is positioned out of the way, which also doubles as a home button if ever needed. Opposite their logo is a login and sign up function and below this is a header that stretches the whole way across the page, this is your main source to navigate around the different areas of the website, such as Sports, In-Play, Totepool, Lotto, Games, Promotions and Mobile. On the left hand side of the page are a few menus to consider, starting with horse racing highlights as well as betting highlights for sports like football, golf and formula 1. Below the highlights customers will be able to view Totesports entire A-Z list of sporting markets, browse live commentary options and even change the way the odds are displayed throughout the site, so if you prefer decimal, American or fractions you can swap with the click of a button. In the very centre of the website is the only advertisement on the site which features a rolling banner that cycles through some of the bigger upcoming competitions and the odd promotion. On the right of the banner is where customers can access their bet slip, this works as a drop down menu to show you all available information regarding your bets and even works out any potential winnings as you go along. Members of Totesport can expect a hefty amount of sporting markets to get their hands on, ranging from, of course, Horse Racing and also Football, American Football, Tennis, Australian Rules, Basketball, Baseball, Cricket, Boxing, Cycling, eSports, Gaelic Football, Golf, Handball, Greyhounds, Ice Hockey, Hurling, Lottery Specials, Politics, Motor Sports, Snooker, Rugby Union, Rugby League, TV Specials, MMA/UFC and Winter Sports. Once you have selected your sport, you will be presented with a list of options, whether you want to browse for the match, game or race you are looking for by the competition or country and they even list different coupons which could save you a bit of money in the long run. We are very impressed with their football coverage at Totesport as they provide some great markets like Match Winner, Double Chance, Goals in Both Halves, Total Goals O/U, Handicaps, Draw No Bet, Correct Score, Clean Sheet, Both Teams to Score, Half With Most Goals, HT/FT and plenty more. Being a predominately horse racing orientated website, they definitely have a lot in store for fans of the races and exclusively cover races throughout the UK and Ireland extensively. 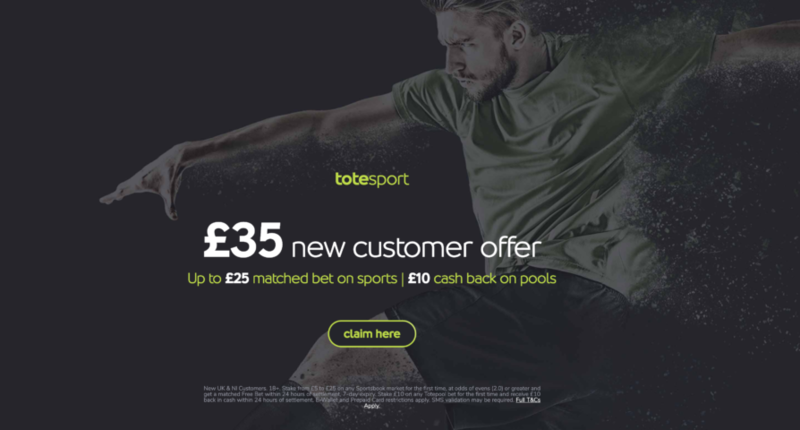 Sports fans can rejoice at the fact that Totesport certainly have your interests covered with a monumental amount of customers orientated promotions featured here. Kicking it off with their welcome bonus, by signing up and registering an account with Totesport customers will give you a free bet worth up to £35. If football is your passion then Totesports’ Double Delight Hat-Trick Heaven might be offer for you, the way this works is if the player you select scores the first goal in a match and then scores again during the game, they will double your price for the first goal scorer. That isn’t all though, if your first goalscorer nets the first goal in the game and then scores a hat-trick inside the 90 minutes, Totesport will triple your price for first goal scorer. Its worth mentioning that Totesport have plenty of other promotions scattered throughout the other sports they cover, namely horse racing, rugby and on the greyhounds. As far as in-play markets go, despite being very horse racing focussed, Totesport have a great list of available markets for all of their customers that enjoy betting at the key, pinnacle moments of sports. You can relish at the fact that Totesport provide excellent in-play betting odds and markets for sports such as Tennis, Football, Basketball, Golf, Darts, Rugby Union, Rugby League, Ice Hockey, Volleyball, eSports and Motor Sport. This is an extremely healthy in-play sports book that we would definitely like to see more on some other sites and if you are a fan of in-play betting then Totesport should definitely be on your list to consider. For all of the punters who seek to enjoy the next level of betting, where you can enjoy your favourite aspects from anywhere in the world, at any time, on a device that fits in the palm of your hand – Totesport has you covered if this is the case. Their mobile application can be downloaded from the Apple app store by all IOS users and directly from their website if you use Android. With their application you will never miss a bet on your favourite team and it comes complete with everything you can find on the desktop version of the site, without being restricted to being at a PC. If you have limited space on your mobile or tablet then you will be pleased to know the application isn’t a requirement. In fact you can access everything available on the application and desktop versions just by opening up Totesports’ website through your portable devices web browser. Customers at Totesport will be able to credit their accounts via Visa, MasterCard, Maestro, Visa Electron, PayPal, Skrill, Neteller and Paysafecard. We love the amount of payment methods they offer and e-wallets are becoming more and more common amongst players due to their speedy cash out time as the funds can show up in your account within 24 hours. Totesport has a few different support methods available to their customers, namely a detailed FAQ section, telephone, email and even a live chat function. We definitely recommend using their live chat service if you need to get in touch with a member of staff as it’s an instant messaging service and their staff are very well informed. Overall, being a traditional racing horse website with a colourful history, Totesport actually have plenty of other sport markets that their player base can enjoy. Their website is incredibly easy to get to grips with and combined with their fantastic in-play betting options, incredible mobile application and invaluable customer support team; we whole heartedly recommend their services and recommend you click below to sign up today.